competition, we can define a zero net growth isocline for a single species utilizing two essential resources (see Section 3.8). This isocline is the boundary between resource combinations that allow the species to survive and reproduce, and resource combinations that do not (Figure 8.34), and therefore represents the boundary of the species' niche in these two dimensions. For present purposes, we can ignore the complications of overcom-pensation, chaos, etc. 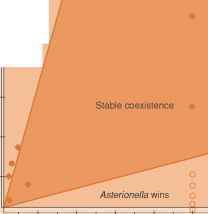 and assume that intraspecific competition brings the population to a stable equilibrium. Here, however, the equilibrium has two components: both population size and the resource levels should remain constant. Population size is constant (by definition) at all points on the isocline, and Tilman established that there is only one point on the isocline where resource levels are also constant (point S* in Figure 8.34). This point, which is the two-resource equivalent of R* for one resource, represents a balance between the consumption of the resources by the consumer (taking the resource concentrations towards the bottom left of the figure) and the natural renewal of the resources (taking the concentrations towards the top right). Indeed, in the absence of the consumer, resource renewal would take the resource concentrations to the 'supply point', shown in the figure. To move from intra- to interspecific competition, it is necessary to superimpose the isoclines of two species on the same diagram (Figure 8.35). The two species will presumably have different consumption rates, but there will still be a single supply point. The outcome depends on the position of this supply point. In Figure 8.35a, the isocline of species A is closer to both axes than that of species B. There are three regions in which the supply point might be found. If it was in region 1, below the isoclines of both species, then there would never be sufficient resources for either species and neither would survive. If it was in region 2, below the isocline of species B but above that of species A, then species B would be unable to survive and the system would equilibrate on the isocline of species A. If the supply point was in region 3, then this system too would equilibrate on the isocline of species A. Analogous to the one-resource case, species A would competitively exclude species B because of its ability to exploit both resources down to levels at which species B could not survive. Of course, the outcome would be reversed if the positions of the isoclines were reversed. Figure 8.34 (left) The zero net growth isocline of a species potentially limited by two resources (X and Y), divides resource combinations on which the species can survive and reproduce, from those on which it cannot. The isocline is rectangular in this case because X and Y are essential resources (see Section 3.8.1). Point S* is the only point on the isocline at which there is also no net change in resource concentrations (consumption and resource renewal are equal and opposite). In the absence of the consumer, resource renewal would take the resource concentrations to the 'supply point' shown. Figure 8.35 (a) Competitive exclusion: the isocline (zero net growth isocline, ZNGI) of species A lies closer to the resource axes than the isocline of species B. If the resource supply point is in region 1, then neither species can exist. But if the resource supply point is in regions 2 or 3, then species A reduces the resource concentrations to a point on its own isocline (where species B cannot survive and reproduce): species A excludes species B. (b) Potential coexistence of two competitors limited by two essential resources. The isoclines of species A and B overlap, leading to six regions of interest. With supply points in region 1 neither species can exist; with points in regions 2 and 3, species A excludes species B; and with points in regions 5 and 6, species B excludes species A. Region 4 contains supply points lying between the limits defined by the two dashed lines. With supply points in region 4 the two species coexist. For further discussion, see text. In Figure 8.35b the isoclines of the two species overlap, and there are six regions in which the supply point might be found. Points in region 1 are below both isoclines and would allow neither species to exist; those in region 2 are below the isocline of species B and would only allow species A to exist; and those in region 6 are below the isocline of species A and would only allow species B to exist. Regions 3, 4 and 5 lie within the fundamental niches of both species. However, the outcome of competition depends on which of these regions the supply point is located in. The most crucial region in Figure 8.35b is region 4. For supply points here, the resource levels are such that species A is more limited by resource X than by resource Y, whilst species B is more limited by Y than X. However, species A consumes more X than Y, whilst species B consumes more Y than X. Because each species consumes more of the resource that more limits its own growth, the system equilibrates at the intersection of the two isoclines, and this equilibrium is stable: the species coexist. Y to a point on its own isocline below species B's isocline, where species B cannot exist. Conversely, for supply points in region 5, both species are more limited by X than Y, but species B depresses X to a point below species A's isocline. Thus, in regions 3 and 5, the supply of resources favors one species or the other, and there is competitive exclusion. It seems then that two species can compete for two resources and coexist as long as two conditions are met. 1 The habitat (i.e. the supply point) must be such that one species is more limited by one resource, and the other species more limited by the other resource. 2 Each species must consume more of the resource that more limits its own growth. Thus, it is possible, in principle, to understand coexistence in competing plants on the basis of differential resource utilization. The key seems to be an explicit consideration of the dynamics of the resources as well as the dynamics of the competing species. As with other cases of coexistence by niche differentiation, the essence is that intraspecific competition is, for both species, a more powerful force than interspecific competition. points, and the results of these are illustrated in Figure 8.36. In most cases the results confirmed the predictions. In the two that did not, the supply points were very close to the regional boundary. The results are therefore encouraging. 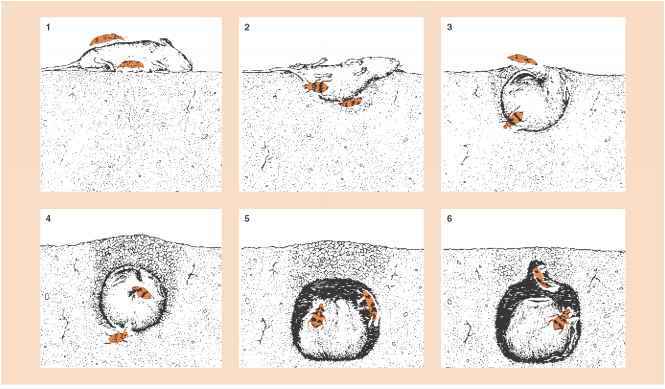 However, it has proved extremely difficult to transfer this approach from the laboratory, where supply points can be manipulated, to natural populations, where they cannot, and where even the estimation of supply points has proved practically impossible (Sommer, 1990). There is considerable need for consolidation and extension from work on other types of plants and animals.